The Tuya Support Center is an intelligent service system of Tuya, designed to improve its service quality and efficiency. As a platform communication tool, it can solve your communication and collaboration problems with Tuya during product development and after-sales service. The Tuya Support Center consists of the Tech Chat and Service Support. Any problems encountered during development can be submitted in the “Tech Chat”, and any after-sales problems of the product can be submitted in the “Service Support”. Tuya has a professional technical support team to respond to your problems efficiently. At the same time, you may be informed of the progress of the problem solution in time because the progress of the problem solution and the problems already solved are traceable. When you click Create Product, the Describe Problem window of the Development Communication Zone will appear at the top of the page. After clicking “Submit your problem to get a solution from our professional team”, a Describe Problem pop-up window will appear. You can submit problems and upload attachments here. Questions submitted at this portal will automatically record your product pid and appid so that Tuya staff can quickly locate your issue. Of course, the more detailed the description is, the faster you can get a reply. Note: Tech Chat’s question window currently supports attachment formats, including support for jpg, jpeg, png, doc, docx, xls, xlsx, ppt, pptx, pdf, numbers, pages, keys, txt, rar, zip, wmv, rmvb, Mp4 , 3gp, mov, avi. Single picture <= 5M, single file <= 10M; upload up to 5 pictures and 3 files. For development problems submitted through both accesses, you can view the progress of the problem solution in the Support Center -> Tech Chat. For problems submitted through the second access, you can also view the progress of the problem solution on the right side of the access which will display the latest problems or three tickets with the latest reply, as shown in Figure 3. If there is a new message reminder, the message font is bold, and the red number in the upper right corner indicates the number of unread new messages. You can click to jump directly to the problem details. You can go to the Tech Chat to view all the historical problems submitted under your account, which may be sorted by the latest reply time or creation time from the more recent to the less recent. If there is a new message reminder, the corresponding message background color is light yellow, and the lower right corner is marked with red “x new reply”. The problems may be in either of the two processing statuses: Processing, Resolved. Processing: The problem has been submitted to the Tuya professional technical team and is being handled for you. Resolved: The problem has been solved by the Tuya professional technical team. Note: If the problem has been solved, but you still have doubt about the processing result, you can directly input the doubt in the reply box to ask. 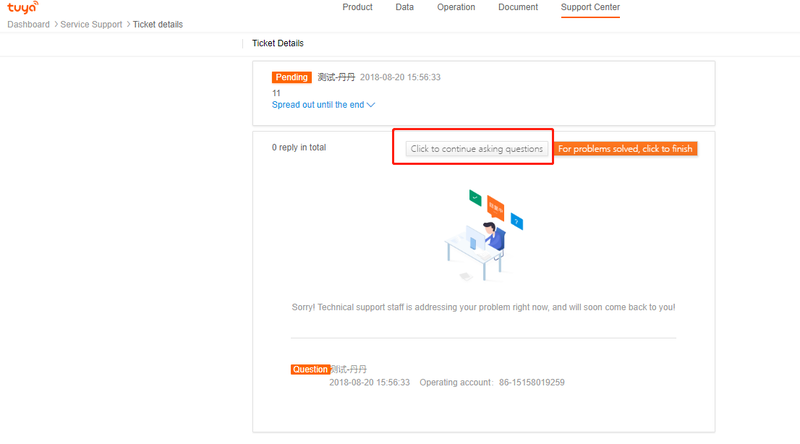 At this time, the status of the problem will be updated as In Process, and the Tuya staff will continue to check and solve the problem for you. Go to the “Support Center” - “Service Support” page and click “Submit a ticket”. The tickets in the List of Tickets may be in any of the four statuses, which are Pending, In Process, Processed, and Finished. 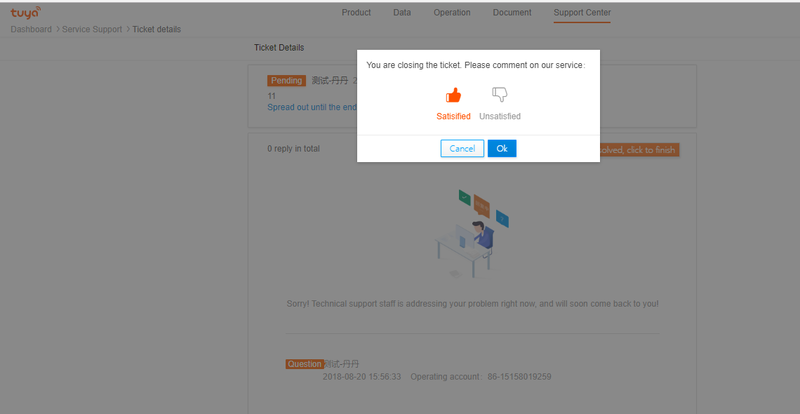 Pending tickets: Newly created tickets, pending for processing by Tuya technical support staff. Ticket in process: Tickets which have been successfully submitted and are being processed by Tuya technical support staff. Processed tickets: The tickets which have been processed by Tuya technical support staff after submitting. Finished tickets: You may comment on the processed tickets which you are satisfied with. After commented on, the ticket will be closed. Ticket search: Supports searching by ticket title, ticket status, creation time, ticket type, problem type, etc. Ticket details: Click on the ticket title to go to the ticket details page and view the ticket details and problem reply. New message reply reminder: When there is a new reply to a ticket, the system will mark next to the ticket title as a reminder. 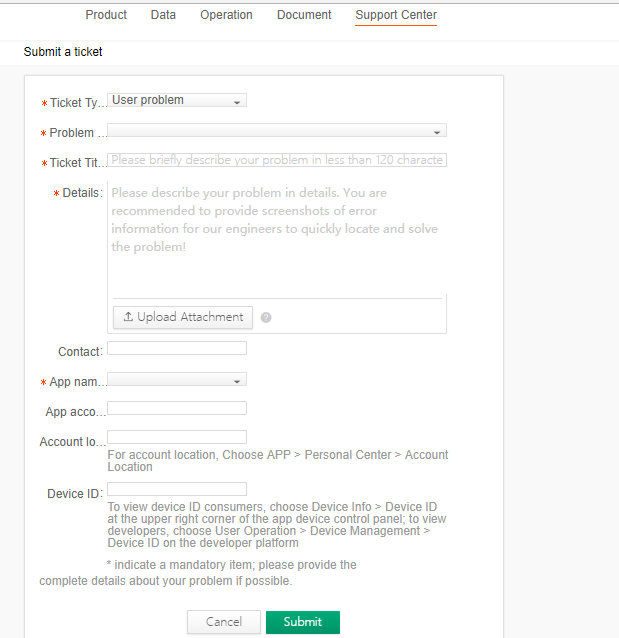 Close tickets: After receiving feedback on the processing result of the ticket problem, if you confirm that the problem has been solved, you can close the ticket, indicating that it has been resolved. Comment on tickets: You may comment on the closed tickets to express your satisfaction or dissatisfaction with our service. View processing records: When viewing a ticket, you can view the reply information associated with the ticket. May you have a pleasant experience with Tuya Support Center!